Proteomic analysis of cerebrospinal fluid in California sea lions (Zalophus californianus) with domoic acid toxicosis identifies proteins associated with neurodegeneration. For the past 20 years, California sea lions have suffered mass strandings thought to be caused by ingesting prey that have concentrated toxins from algae blooms. These domoic acid toxins (DAT) cause neurodegenerative disorders by crossing the brain-blood barrier and interfering with nerve signal transmission. Diagnosis of DAT is problematic because domoic acid is rapidly cleared from the body and may not be directly detected when stranded sea lions are ultimately found. Additionally, proteomics is difficult since the genome of the sea lion is not sequenced. 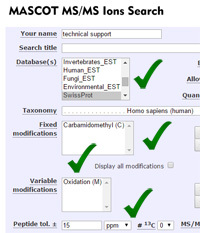 To overcome this, the authors searched against protein sequences from several better characterised terrestrial mammals. 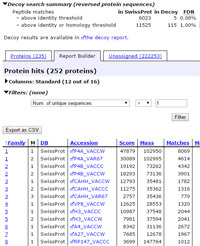 From the LC/MS/MS of 11 samples, a total of 206 proteins were identified (FDR < 0.1) using the composite mammalian database. Several peptide identifications were validated using stable isotope labeled peptides. 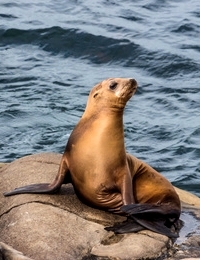 Comparison of spectral counts revealed seven proteins that were elevated in the cerebrospinal fluid from sea lions with DAT. Mass spectra have been uploaded to ProteomeXchange (dataset PXD002105).